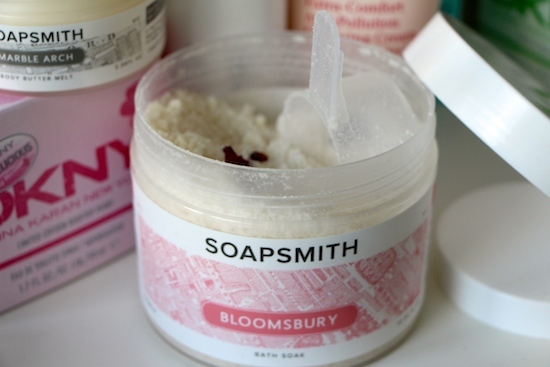 If you’re into highly highly fragranced bath and body products but would rather stab yourself in the eye with a fork than set foot in a Lush store* then you might want to take a look at Soapsmith‘s little range of potted and bottled stuff. It’s all made in East London, by hand, and each of the scents that the products are available in are named after London streets or areas. Which could be horribly tacky, but it’s done in such a chic and modern way, with beautiful little maps and pretty colour-coding, that all is forgiven. I have to say that I felt just a little disconcerted by the dried rose pieces that are spiked through the powdery soak. Once re-hydrated and floating darkly in the water, they looked not unlike dried flakes of something or other that I won’t mention (blood); but in the spirit of fairness I should tell you that there were only three in my whole bath, and once I’d checked my body in its entirety for signs of injury, frantically splashing water all over the floor and almost having a coronary at the thought that I was spontaneously and mysteriously bleeding to death, I found the whole bath soak experience incredibly relaxing. And now to the Marble Arch Body Butter Melt. Why you would ever name anything, ever, after Marble Arch I have not the foggiest, but this body butter is brilliant. Again, scent-overload – when I applied it to my hand the people in the next village all leant on their hoes and tipped their faces into the wind and made cooing sounds – but scent-overload in an extremely good way. The smell (vanilla, tonka bean and orange) reminds me very much of a blood orange-scented body lotion that I used all the way through my honeymoon, but – oh boy! – the texture is far from similar. This butter is so rich that it melts down into a thick oil rather than any kind of cream or lotion and you can get a really good massage going on if you have any dry bits that need taking care of. Highly recommended: top notch. If you do your whole body you might want to skip on perfume for the day, otherwise do your shins and arms and wear something orangey or warm in the perfume department – I’ve been using my La Vie Est Belle over the top and that seems to work nicely. I haven’t been arrested by the scent police, at any rate. 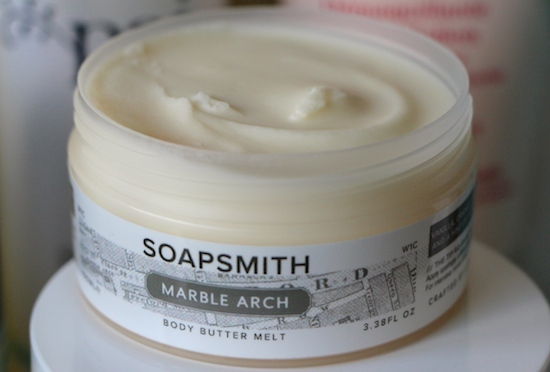 You can buy SoapSmith’s products here – the body melt is £8 and the tub of bath soak, £12. *no offence to Lush-lovers, I’m just going on general feedback and…er…personal leanings. There are a couple of products that I LOVE from Lush, but it’s probably quite telling that they are the unfragranced ones!